Flu hits and no dolls being finished! I have been hit with the flu and just can't seem to get enough energy to finish any of the holiday dolls I started. Today is the first I've felt well enough to really do more than check email. I have 3 really pretty angels that just need their faces done and wings glued on. I also have more of the Christmas elves I made last year sewn and ready to be stuffed but instead of working on them I've been laying around reading. Lucky for me that last Sat. before I got sick I went to my local library and got some dvds and books. This week I finished Ernie by Ernest Borgnine and American Prince by Tony Curtis. Interesting reads. I found I liked Borgnine more after reading his book and Curtis less after reading his. I found it nice to know that Borgnine did like doing McHale's Navy. My Mom always said there was a rumor he only did it for the money and felt he was really too good to be doing it. It's also great to know that the old guy (91 !) is still pretty healthy and working. I always enjoyed Tony's work, even some of the really bad movies, but after reading about how much he cheated on his wives and how he still seems to feel there was nothing wrong with it, I have to admit I'm not as big of a fan as I once was. This is a guy who enjoyed women so much he really should have been like his buddy Hef and stayed single until he got much older. Last night I started Cheech & Chong by Tommy Chong. He's a very good writer and I was surprised to find that he was a muscian in bands in Canada in the late 1950's. I'm really enjoying the book but after I finish this one I've got to get back to sewing! 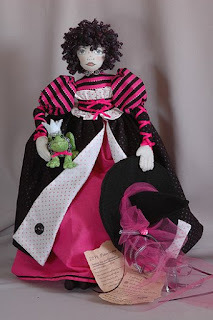 I actually made this doll last fall and had her on ebay but she didn't sell. I packed her away in a halloween bag (of course!) and now she's listed again. I hope by getting her on early she'll sell this year. 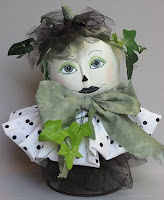 I really like making these king of dolls and want to make a few this season. Been really busy making stuff. I tatted some trim to use on fall dolls and crocheted some trim using eyelash yarn to trim paper gift bags. I thought I'd have a go at making them for something different. I also have 4 more paper mache pumpkins I'm working on. They're a lot of fun to make! Still working on a fall tree lady. The wood base is giving me way too much trouble. I tried crackle but it was too humid and it wouldn't work, then I tried mod podging skeleton leaves but the mod podge was old and wouldn't dry. So now I scrubbed off all the old stuff and am going to try crackle again with a new bottle of crackle medium. This picture shows the leaves before I put a coat of mod podge on. All it did was bubble and smell awful. I won a prize at Bonehead Studios! In my last post I told you about Flora at http://www.boneheadstudio.blogspot.com/ having a drawing to celebrate her blog. Well, I entered and my name was chosen first! Yay me! I really needed a pick me up since I have a had a bad case of the blues since April. Going from one sickness to another didn't help but winning a gift sure does! I thought I might try this but now that ebay isn't going to allow any outside links, I wouldn't be able to share the contest with my friends in the ebay groups I belong to. Happy I didn't start a group because the leaders are in charge of removing outside links or their group could be suspended. Got my domain renewal from yahoo. It's gone up again, this time to $34.95. Why are they treating their old customers so bad since new domains are really cheap? Must be taking lessons from ebay! I have a small crocheted thread bear done. I wanted him to hold something so I'm working on a little paper mache pumpkin. Just have to paint and decorate it! Hope to list it on ebay next week. He's a halloween bear with a ruff collar and cone hat. I'm finally back and lot's of stuff happening! Finally back and without that stupid cold, but I do have a bad sunburn. Dumb to garden without putting on sunblock! And don't forget to look for my ad in the fall/winter issues of Soft Dolls & Animals magazines. Finally got a rabbit I made in April up for sale on eBay. I only made 2 rabbits for Easter but didn't get them finished in time to put them up so they have been packed away. This is the folk art primmy looking one. I'm thinking about adding wings to the other, so it's not up yet. I really like her. 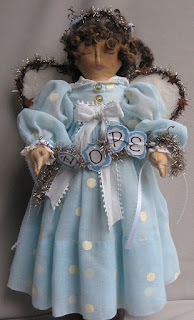 I used the same pattern I used to make the winter dolls I sold on ebay to make her. She's teastained and has a bit of needle sculpting to her body. Her felt hat is removeable. Here's a pic of the other rabbit. She's not up yet because I don't have her wings on her yet but I thought I'd post this pic anyway. A friend at Fairyzine has come up with a term called cupcake chic. I think she falls into that catagory. As you can see I was really into dots in the spring. In fact I've been using dots and stripes a lot in the past year. I'm finishing up 2 small crocheted bears. One is done for Halloween and the other is a butterfly bear. I'll post pics when I put them up at ebay. 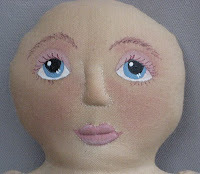 I'm also still working on the pattern for the prim folk art topsy-turvy doll. Got side lined with the cold but hope to get the faces painted this week. Won't be posting again until I actually get some things done. Thought I'd post even though not much is going on. 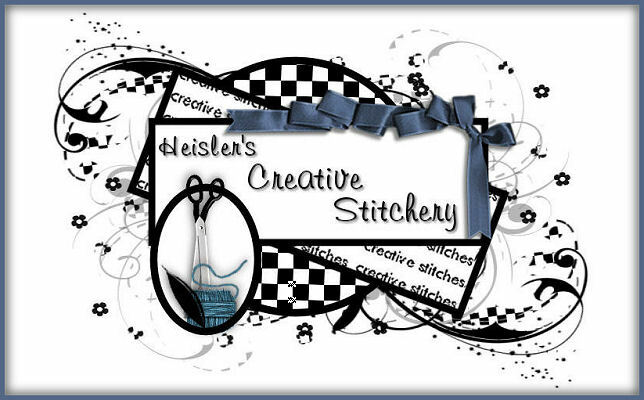 I did set up a store at http://etsy.com under 1creativestitches. Still not happy about having a number in front but I couldn't get just creativestitches or anything cool like creative::stitches or creative---stitches. 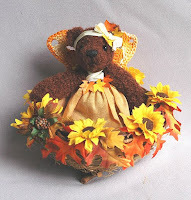 Have 3 of my patterns up and if I'd ever get out of my funk I plan on putting up all of my old handmade bears from when I was still doing craft shows. I was going to sell them for $10 and under but just may wait until the area I live in has their community yard sale and try to get rid of them there first. Still working on the newest pattern but once again have gotten sidelined because I got an idea for one I'd rather make. If I'd ever finish all the patterns I have in various stages I'd have more than 50 for sale. Then there's wanting to work on some dragons I made last year. I was invited to join a group at ebay for dragon makers so now I've got dragons on the brain, too. Then there's the cd full of halloween clipart I bought from Dover. I want to make tags, jewelry and print some on fabric. Does anyone else feel that when you have too many ideas and projects going you just want to close the door to the sewing studio (or where ever you have your stuff) and veg out watching tv or read? I used to tat when I felt so over whelmed but now I even let that sit. Did make one big decision. I have been working off and on for over 15 years on 2 books of tatting patterns. I finally realized that it's a pain trying to find a publisher (haven't looked and don't feel like it!) and printing it myself would be too expensive with all the color photos. I had been going to buy one of those binder thingys at Staples so I could make them with a spiral at the side edge but have decided to split them up and print them just like my doll patterns. There will be 3 -4 per pattern. Another big decision is that I'm going to advertise in 3 issues of Soft Dolls & Animals Magazine. They have a great section in the back that's only $30 a month. Look for it in the last 3 of the year! Just a quick post about my etsy store. Finally got it up and listed my first item. It's for my new Lovelorn Lena pattern. Here's the link: http://www.etsy.com/shop.php?user_id=5658401 if you want to have a look. From what I can tell it's better to post something everyday or so, not all at one time to keep your store at the top of search lists. It's weird how they list stuff but with so many newbies, things are changing over there. Catagories are being fixed. I'm so glad that self-published patterns will be going into handmade supplies. I hated the idea that my designs would be listed with the big guys you can buy at any fabric store. With more people joining and giving feedback I hope it becomes easier to use. Dsl dreams can come true! Just a quick post to say how happy I am to finally have dsl. The slow dial-up I had kept me from doing so much but now, look out, I'm reading blogs and web sites that used to take 10 minutes or more to load! For the past few days I have to admit to not getting any work done as I go to sites I always wanted to see like the fairy society but couldn't because they were so graphic intensive that they just wouldn't load. Fun to see but didn't join. Same with the Harry Potter Lexicon. Did get a store open at etsy under 1creativestitches but I'm not sure I'm going to stick with that name. I'm not happy with the one in front so I may have them close that account and reopen as creative::stitches or creativestitches::, there are already 3 other creativestitches but I hate to give up the name everyone knows me by at ebay. I also thought about going different with magicstitchescreations or creativemagicstitches but they are both kinda long. I have the worst time trying to make up my mind about anything so the store will sit empty until I do. I noticed that some people have mulitple stores to sell different things and I thought about that, too. I could sell patterns and supplies at one store and finished items at the other. That seems what a lot of people do. I did make a great banner for the store and used my little sewing girl as my avatar. You can go to http://ww.etsy.com and choose user name from the search drop down menu to find me if you want to see what done on the store so far. 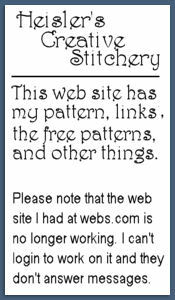 Oh well, I'm off to catch up on more sites and blogs! This week I hope to post pics of the 2 rabbits I finished. 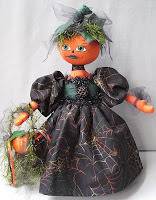 Besides Halloween Artists (HA31) I also belong to another fun halloween group at ebay called Society of Eclectic Halloween Artists (SEHA). They are a busy group, always having contests and challenges for it's members. Type in HA31 and SEHA to find some great Halloween art at ebay. 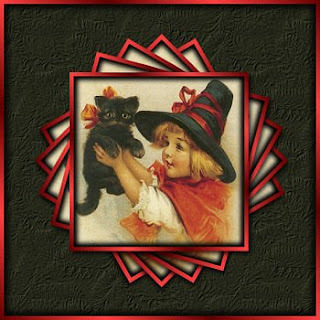 The link for Halloween Artists web site in my links section takes you to our group site where you can see members work and read about halloween. SEHA hasn't started one yet. HA31 also has an off-site mesage board so we can talk about stuff ebay wouldn't want us to and a blog. Now that I'm ready to open a store at http://www.etsy.com/ I'll be looking to join some groups there, too. Def need some networking over there! So much new to learn. Big news for me, I'm getting high speed DSL this week! I've been on sloooow dial-up since my first computer and with how long blogs and other sites can take to load, was going crazy waiting and waiting. Keep your fingers crossed that it all works out! 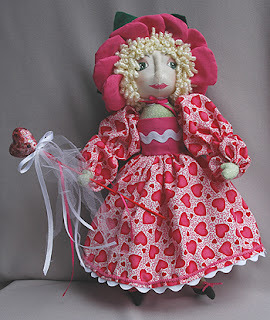 I am working on the new pattern for a topsy-turvy doll. Sorry but no pics to post yet. I'm also finishing up 2 rabbits that were supposed to be done for Easter but I got sidelined and am just finshing them now. March was just too early for me to think rabbits. Doesn't it seem like it should be Easter this weekend? I realize many love to leave comments after they read blogs, it's part of the experience isn't it? But after saying that I have to admit I don't check for them. If you have ever tried to comment or even email me I have to say I'm sorry. Maybe when I get caught up on more things I'll change the settings. Lovelorn Lena and her Frog Prince! Yeah!!!! I finally finished my new pattern. It certainly took long but she is done and available for sale. 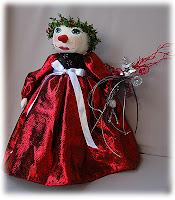 You can buy her at my ebay store and my web store. I plan on opening an etsy store and will have her there, too. 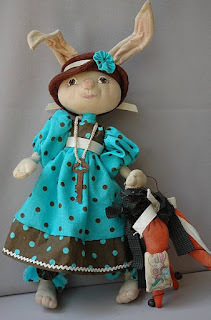 Hopefully I can get here at some other sites like http://www.clothdollpatterns.com/ and http://www.dollmakersjourney.com/ . 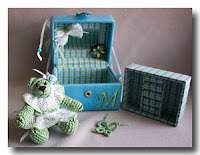 They both sell some of my patterns but I'd love to get in some other online stores. The picture is the same as I'll be using for the cover. Don't you love the frog?! I include 2 "spells" that are already printed. They are just bits of whimsey I made up. Also included is a face printed on muslin. Just paint or color in the features. So easy! There are 49 color pictures and 29 line drawings to make following the directions easy. 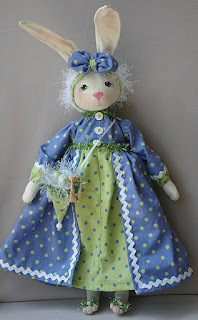 Because of all the pictures, drawing, and the muslin face this pattern will sell for $12.00. Did you know that ebay no longer allows e-patterns to be sold? I was trying to decide which version of Adobe Acrobat PDF maker to get when I found this out only by coming across some listings on ebay. I think I'll still get the software and offer e-pats at my sites and the etsy store. I love e-pats., it's great to get them right away. I think I'll still send a photo for the cover though. 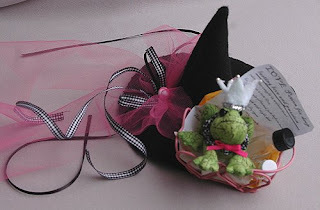 Hope you'll want to make her and the frog! 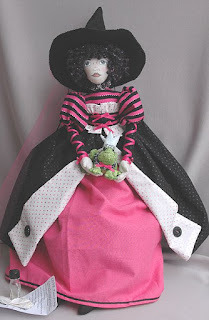 I'm even amazing myself to be back here so soon but I wanted to let anyone who's reading that I finally updated the handmade dolls and bears section at my web store site. Ok, I admit most of what I put up has already been sold but at least you can get an idea of what all I can make. 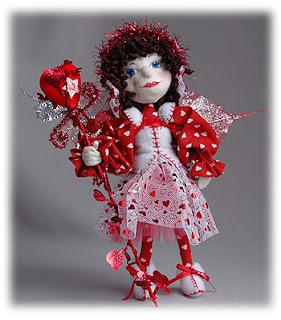 There are snow ladies, tree top angles, jewelry, and Valentine dolls for sale. Oh, and I have 4 mini thread crochet bears on bears 1 and 2 for sale. I removed all the fake fur bears from the site because I'm seriously thinking about opening a store at etsy. I'd like to get rid of them at really low prices but with ebays fee increase that's not the place to sell them, I'm hoping etsy will be. Someone at one of the Halloween groups I belong to at ebay wrote that google is thinking about getting into the auction business. We can only hope! Yahoo never did enough to promote their auctions when they had it. After all the press the ebay revolt got, I bet Yahoo's wishing they hadn't shut it down last year. Ebay is killing off all the small stores and sellers and the post office with their yearly increases isn't helping either. We so need someone to go up against ebay that has the money to advertise on TV so people will know about it and use it. Sites like epier, ecrater, and others just don't have the money for TV ads. I'm off to play with my google web site. Right now it has 1 page, so much work to do! I am worried that google might shut the sites down and then all the work would be wasted. I will be going slow building the gallery I'm putting there. Life intrudes again on my blog. This time with the loss of my baby girl, Spice. She had just turned 16 on the 6th of Feb and though she had been ill since last Sept. ,when she had a stroke, I thought she'd be with me longer. 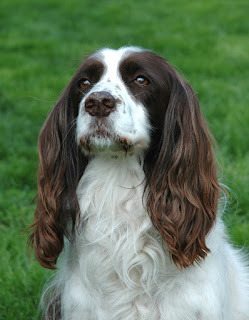 She was a sweet huggy dog child who will be missed beyond measure. Your golden voice is still. But I'll take that vacant spot of floor and empty muted hall and lay them with the absent voice and unused dish along the wall. 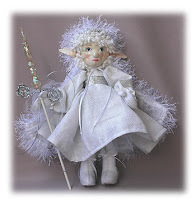 I'm slowly working my way thru my old web site and updating the handmade dolls and bears pages. It's taking longer than I had hoped but little by little I'll get it done. I have pictures of the things I made for Halloween up, even though most are sold. At least now customers will be able to see some of my work. When I get all these pages done I plan on starting a new gallery site for the things that are sold. 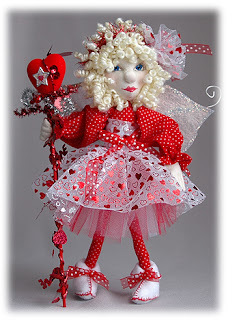 Finally got 2 little Valentine fairies up for sale at the eBay store. See the pics below and above! I'm almost done with the 2 flower ladies. I hope to finish them tonight and get pics taken this weekend. I like to take them outside but right now there's an ice storm going on out there. BRRRRRRRR ! I have taken pics when it's really cold and even windy but it's not something I really want to do. I used leaves for the wings of the fairy with the brown hair. I really like how the skeletonized leaves look but I am worried about shipping the doll. The blonde's wings are made from a sheet of angelina fiber. I bought some and ironed a sheet 2 years ago. Never could get around to using it until now. This past year I gathered up all kinds of info on making wings and hope to try some out. It's always been easier to buy than make them but I'm going to try some different types as I make spring fairies. I've also got Spring rabbits on my mind. They're the next things I plan on making for the store. If you read any of my past posts you may be wondering what ever happened to the new pattern I was working on. Well it's under gone 4 transformations. From there being 2 dolls to now only one, clothing changes from the original drawing, a valentine doll, to now being a witch. Never know what she'll eventually end up being. Look for my patterns being sold as e-patterns sometime this spring! 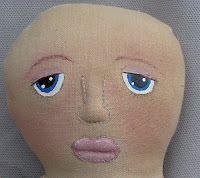 I've been trying to paint doll faces today but it's hard to concentrate when it's so cold and windy. 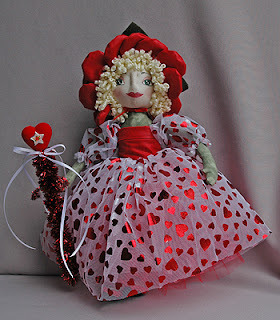 I'm working on Valentine dolls. Two fairies just need their wings and 2 flower ladies need their faces finished and dressed. 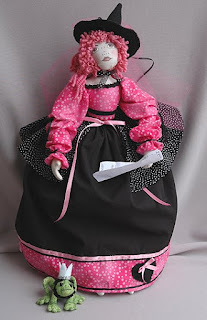 Last week at the ebay store I sold 6 dolls to one customer! I was a bit scared at first because you hear about people who buy things, pay with paypal, then file claims that they didn't get what they ordered so paypal gives them their money back. The sellers are stuck, no items, no money. I sent them out on Fri. and am hoping for the best since the buyer has great feedbacks. Her name is Princess Irena. I'm liking this theme so much I have an Ice Witch in mind if I have time to make her. Another of my problems is finding all the supplies since we don't have a big fabric/craft store near. One of the ebay groups I belong is having a winter theme contest and I made the Jack & Jackie Frost dolls and this one for it. My customer bought all 3 dolls. I took this same pattern and reduced it so I could make smaller elves and fairies. They don't stand as well with smaller feet but I really like the small size but then again I always prefer small dolls to big ones. Back to work and trying to stay warm! No wonder I'm thinking about icy dolls, it's 6 out!